Art is a universal language. At AIM HIGHER we use it to help everyone communicate what is within them. Regardless of our ability to draw a straight line or mix colors perfectly, the products created in this program are more than just pieces of art. They are expressions of who we are, how we feel, and what we want people to know about us. For many of us the most enjoyable experiences are the ones in which we can become physically involved. 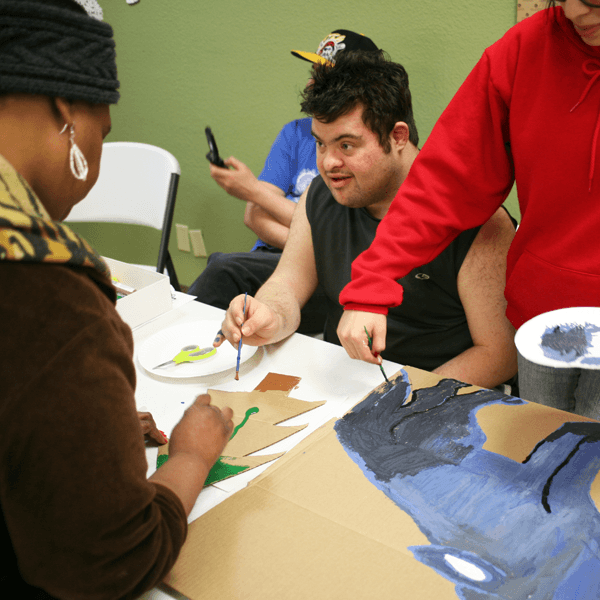 More than any other Fab Five component – Arts & Expression provides the constant hands-on engagement, learning, and creating that every participant enjoys. The results are plentiful and tangible. You can take your artwork home, hang it on the walls at AIM HIGHER, sell it at a local market, or give it to a friend. You can be the lead role in a play, or serve as a lighting technician in a production for one of your friends, or for people from all over the community. The sky is the limit to what can be done in the realm of Arts & Expression. All you need is the desire and determination – the rest will come.